Q: I am a new vegan and recently jumped off my eating habits. I started eating what was available but when I started eating chicken again, organic or other wise, it has really affected my body. Some of the effects are not leaving my body. What should I do? A: The longer you are plant-based (and stay plant-based) the lingering effects from eating chicken, etc. will start to go away. It's not instant, but you should start seeing improvements within a few days. I also can't recommend the 3-day reboot or 10-day cleanse enough for this type of a situation. If after a few weeks you don't have substantial improvement, you may need to seek medical treatment. Q: You blogged recently about using baking soda for all your personal hygiene. Does it work for shaving? If you shave, what do you use, and would the same thing work for my husband? Thanks! A: I use baking soda for my body as a daily wash (it's a great exfoliator!) but I also have a regular bar of soap (for guests) that I'll also use to suds up my legs before shaving (though I have shaved with just water plenty of times). Admittedly, I prefer to "wax" over shaving. My husband has very sensitive skin and shaving with just water is too irritating, so he uses an old fashion shaving bar (soap). 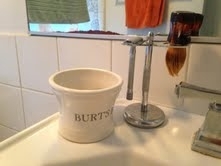 He uses Burt's Bees Rum Shaving Soap Disc. It's $3.99 for the soap (plus you'll need to buy a brush and container) but it lasts for a year or longer. He's been using the same bar for 2 years now. Best (hygiene) investment ever. If your husband is an ethical vegan, the bar may not be suitable (some of Burt's Bees' products contain honey) but I'm sure there is a comparable vegan brand. Try LUSH? Q: I paid through PayPal for my 1 week family meal plan and now what? Is it sent to my email or do I need a log in and password? Thanks! A: Once the funds clear you should receive an email to download the plan. Please check your spam box as it may end up there. If it's still missing more than 4 hours after payment (it can take up to 4 hours for the funds to clear with PayPal), contact the support team at getmealplans.com (support(at)getmealplans(dot)com) or use the live chat on the website. The support team will investigate/send the file if necessary. Enjoy your meal plan! Q: I am very worried about a friend of mine. She doesn't eat healthfully and she recently had a mini stroke. I don't want to overstep my boundaries, but I feel she needs information. Do you have ANY advice on how to approach this situation? Thank you! A: I would start off by telling your friend how much you love and care about her. Then explain that because you care so much, you're concerned about her health, especially given her recent event. Say that you want to help and that you have found ample research out there that strokes are caused by diet and a plant-based diet can prevent strokes from happening. Explain to her that you follow this kind of diet and you have experienced the most amazing benefits and results. Then offer to watch Forks Over Knives with her or something like that. Maybe buy her a book or a cookbook.... and give her some Happy Herbivore muffins at the same time :) Muffins make everything better. Q: What are some of the best places to eat in NYC? A: I haven't lived there for a few years, so I'm not sure what's around or new. I always liked Red Bamboo but never cared for Blossom or Gobo. I really liked Candle Cafe and Candle 79, though the food is very rich and both places are expensive. My favorite vegan pizza place closed. Boo hoo. There are a lot of places in Brooklyn I never tried but have heard good things about, especially if you're looking for vegan junk foods like corndogs, etc. Supervegan is a website dedicated to vegan restaurants in NYC with reviews, etc. might be a good place to look.